The opportunity to raft local is available to residents of Nevada City, Grass Valley and many more. Less than an hour’s drive on Hwy 49 or Hwy 80, the American River is home to beginner, intermediate and advanced whitewater. Two types of trips are offered for just about any age on the South Fork from our Class II Tom Sawyer Float to the introductory Class III whitewater on the Upper Chili Bar section or the Lower section to Folsom Lake. 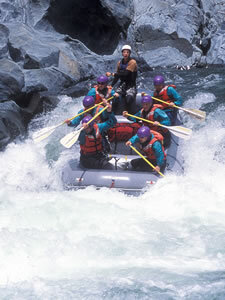 Class III / IV whitewater, rafting through a rapid named Tunnel Chute and a “Wilderness" canyon near Auburn State Park are just a few of the amazing features offered by the Middle Fork of the American. The North Fork American supplies the early season adrenaline rush with Class IV whitewater. Catch this trip near Colfax in April-May.